A double bed all made up with Egyptian cotton linen & towels for you. There is power supply so you have light, a kettle and a small fridge. What about toilet and shower facilities? There is a waterless toilet nearby that is shared with other guests and there is a flushing loo and shower with hot and cold water at the farmstead approx 50 yards away. Oh yes we call it the Barn Room - with wifi and where there is a microwave, kettle and toaster, and a few games too. A small wild camping space has room for a few tents. There are toilet and shower facilities for camper's use in the farmstead and some parking in the nearby yard, none in the camping spot. The MorphPODs all sleep 2 with the exception of Willow which does have room to bring the kids too. they are all well insulated and Willow has the option of an electric heater for use if necessary. 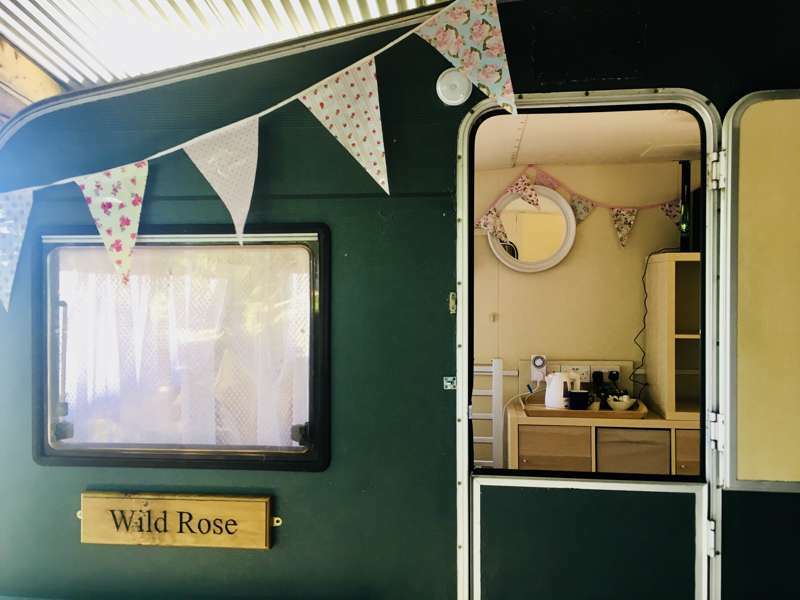 There is 1 shower and toilet (50 yards away), waterless toilet (20 yards from Willow POD and from Wild Rose Vintage Caravan), hot and cold water. Horse owners can choose from 12 stables, with wood-pellet bedding and have access to clean grass paddocks. Brandy House Farm is also home to a small flock of Jacob sheep, Welsh Black Mountain sheep, 8 horses, Bonnie the collie, Dolly the spaniel and Marmaduke the old cat who lives on the boiler and Timmy the yard cat. Campfires in designated fire-pit only. Dog friendly site but please note that dogs do need to be kept on leads when on the farm. Glampers, wild campers, groups, well-behaved dogs and DIY livery for guests who bring their own horses – yes. Caravans, campervans, motorhomes – no. Walking and mountain biking from the doorstep most often centres around the Glyndwrs Way, an excellent national trail which passes through Brandy House Farm. Richard and Medina have excellent knowledge of the surrounding routes and can help walkers, cyclers or equestrians alike in their planning, they also have a handy route portfolio waiting for you. For the most immediate exploration, either walk up onto Beacon Hill Crown Estate from your door step or stroll into the village (5 minutes away) to join the footpaths on the Shropshire side of the border. Beacon Hill (01597 823298), a 6000 acre upland nature reserve, is an excellent place to see wildlife. The heath clad landscape attracts birds like the nesting Wheatear, Meadow Pipit, Stonechat, Merlin and Peregrine, among others. It's wild without being rugged and an excellent place to begin walking in the area. Cyclists will find great XC riding on the doorstep and easy journeys to several world class mountain bike centres with freeride, downhill and uplift facilities. The area hosts MTB enduro and the Autumn Epic, One of Britain's top rated Cycle Sportives. For something a little less energetic try exploring Powys Castle (01938 551944), 20 miles away, The Hall at Abbey-Cwm-Hir (01597 851727), 20 miles, or Judges Lodging Presteigne (01544 260650), 18 miles away. If you prefer not to cook then it is possible to book a campers breakfast brought to your pod or caravan. A dining room breakfast and evening meals in the farm building are also bookable in advance. The Wharf, local village pub ideal for a drink is just 5 minutes walk away but doesn't serve food. The Radnorshire Arms, Beguildy (01547 510634), 2 miles away, is the nearest pub serving food, a wonderfully old building that is home to friendly service and good food. Beguildy also has a lovely traditional village shop. If you are approaching from Knighton, turn up a sharp left as you pass the speed limit sign on reaching the village, opposite the village sign (please note that the Brandy House is not signed). Continue up the lane over the two cattle-grids and Brandy House Farm is at the top about 150 metres from the main road. If you are approaching from Newtown, leave on the A483 (signed Llandrindod Wells) to Dolfor. Turn left onto the B4355. Go through the village of Felindre and as you leave it, turn up to your right just before the end of speed limit sign (please note that the Brandy House is not signed). Continue up the lane over the two cattle-grids and Brandy House Farm is at the top about 150 metres from the main road. If you are using a sat Nav or google maps and are approaching from the North they will more than likely take you the shorter scenic route through tiny and steep lanes missing out. For a more direct route we would recommend you go to Newtown and follow the directions above! Knighton (0845 748 4950) is the nearest train station 9 miles away or Newtown (0845 748 4950), 12 miles away.